I’ve heard this often. My response is: if you don’t have competitors then your business idea is either so bad no one will touch it (possible), or so great it’s been done before (probable) – which is a proxy for saying yes, you do have competitors. The space you occupy is not empty. But if that space has competition trying to elbow you out, then the good news is, it also has influencers who can help keep you in. Believe it: some people out there love you, or love what you do, or love the sector you operate in. They’d be ecstatic if you approached them to work with them. 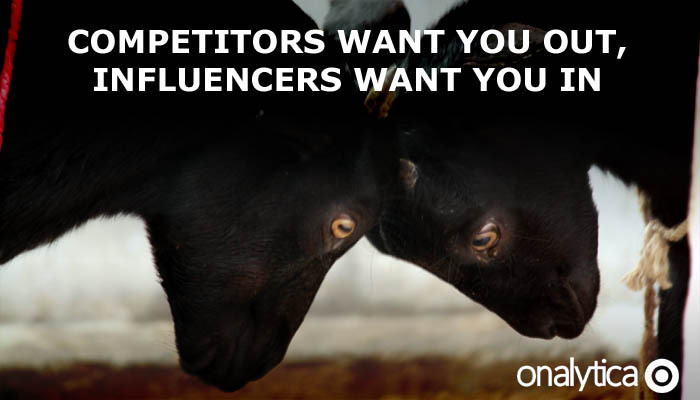 They’re your influencers, and, like your competitors, you need to know who they are. First of all, why? Why do this? If you’re from a PR background, you’ll understand that people are more likely to believe third-party recommendations (PR) than what you say about yourself (advertising). So, your influencers will not only amplify your voice, they’ll help give that voice more credibility. Secondly, don’t you know who they are anyway? If you’re not sure, then ask your staff! Ask them who they regard as influential, from whatever source – who they watch out for in trade publications, who they keep seeing at conventions, who they follow on Twitter, or which blogs they read, who they’re linked to in LinkedIn – or just who they happen to know is a mover or shaker in their field. In what, an hour, you’ll have a great seed list. Make that two hours if you follow what Onalytica has to say about how to find more influencers. That’s the influencers you know about – the ‘low hanging fruit’ – simply because you’re already familiar with your space. But how do you find more influencers in new areas? Or how can you be sure you’ve covered all angles? For example, if you wanted to identify key communications bloggers via vanity metrics such as Twitter followers or LinkedIn connections, you might miss out Richard Edelman. He’s the CEO of the largest privately owned PR agency in the world. He blogs about once a week, so he’s not especially prolific. He has around 15,000 Twitter followers, which is pretty good, but again not huge in the grand scheme of things. Vanity metrics would not necessarily identify him as one to follow. Another example: let’s say you want to do work around green issues. Who’s the most influential person in that field? I was once asked this question during a discussion about influence. It turned out to be the then-mayor of London, Ken Livingstone, according to Onalytica’s analysis. Of course it was. When you think about it, this makes perfect sense. But if you went purely through people who self-identified as green influencers, you could easily have overlooked this. That’s where sophisticated technology can really help uncover the bona fide influencers. So much for the missed opportunities. What about the threats of not understanding who your influencers are? I attended a very interesting business lunch a few years ago, in which an employee at a tech company described how she’d identified influential bloggers and had a great blogging programme going with them. A major (and much larger) competitor started a very aggressive marketing campaign aimed directly at them. The employee described very well that sinking feeling of trouble ahead. But she wasn’t in trouble because her influencers rescued her. Before that day was out, the bloggers had between them created a hashtag for counter-attacking the antagonist, and written extensive, highly informed – and highly read and shared – blog posts telling it from their side. The attacks stopped, and there are no prizes for guessing who came out of that with their reputations enhanced. So, influencers can see you through good times and bad. But what they’re really for, is changing behaviour. Generally, people either want to start something they haven’t managed to do yet, for example lose weight, or want to stop something but haven’t made that commitment yet, such as smoking. Your communications programme has only really ‘worked’ when you’ve influenced that behaviour change. For most organisations, that means it only really ‘works’ when the people who had you on a shortlist, alongside your competitors, hired you instead of them. That’s where the really important analysis comes in. How did your communications change the situation? What was different between before, and after? In the past I’ve heard these called ‘outcomes’ but I think a better word is ‘impact’. What impact did any of your work make? I’ve spent many, many hours trying to figure this one out. I’ve built huge spreadsheets, designed bespoke systems that analyse social media feeds, compiled vast amounts of data manually… and I think I’ve managed it, but with a lot of hard graft. Companies like Onalytica can do this with much more robust methodologies, greater consistency and real insight. If you’re reading this, then you’ve made a start. Tomorrow, try putting together that list I mentioned, as a next step towards building an influencers list. Build a group of them in Twitter, then you can monitor them as a body of influencers. Connect with them on LinkedIn and, if they blog, subscribe to that. Make sure you interact with them, and get on their radar. Then, one day, when you want to amplify your voice – or even defend your own interests – they might just be your most powerful resource. Brendan Cooper is a copywriter and content strategist who has been helping people to communicate, online and offline, for over fifteen years. He has worked in publications, communications and social media strategy for world-leading brands such as ADP and Imagination Technologies, and agencies such as Porter Novelli and Fleishman-Hillard.